Work with the position, top, bottom, left, and right properties. Work with the float and clear properties. Elements appear on the page in the same order they appear in the code. Block elements appear on separate lines in single columns. Top and bottom margins collapse between block elements, so two block elements on top of each other will be separated by the margin of the element with the larger margin and not the combined margin of both elements. 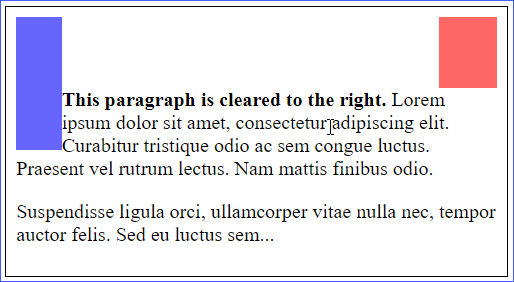 Inline elements appear on the same line adjacent to each other and any text as long as there is space. If there isn't space, they will wrap down to the next line. This is a div element, a standard block element. This is a div element that contains a paragraph element. With CSS, we can move elements into a separate flow. This allows us more control over the design and layout of our pages. Throughout this lesson, we will be looking at the different ways we can do this. static - The default value. The element is part of the normal flow. relative - The element remains in the normal flow, but is positioned relative to its default position in the normal flow. absolute - The element is removed from the normal flow and no space is left for it in the page layout, and as a result it does not affect the flow of the elements around it. It is positioned relative to its closest positioned ancestor*. If it has no positioned ancestor, it is positioned relative to the document body. 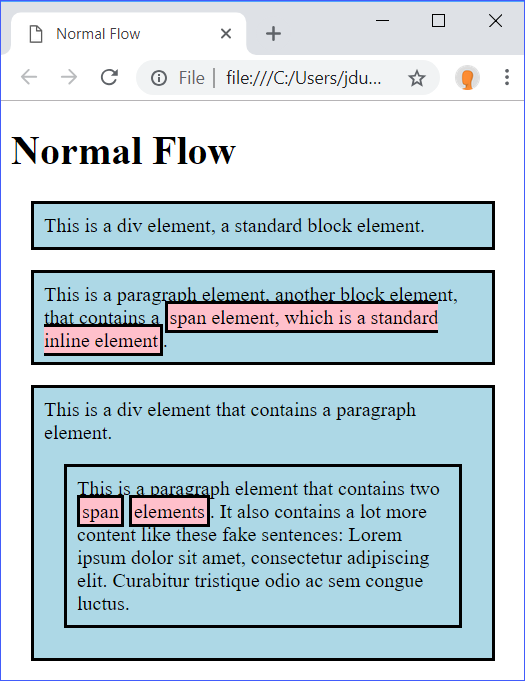 fixed - The element is removed from the normal flow and no space is left for it in the page layout, and as a result it does not affect the flow of the elements around it. It is positioned relative to the viewport, meaning that even when the page scrolls, it will stay in the same place. 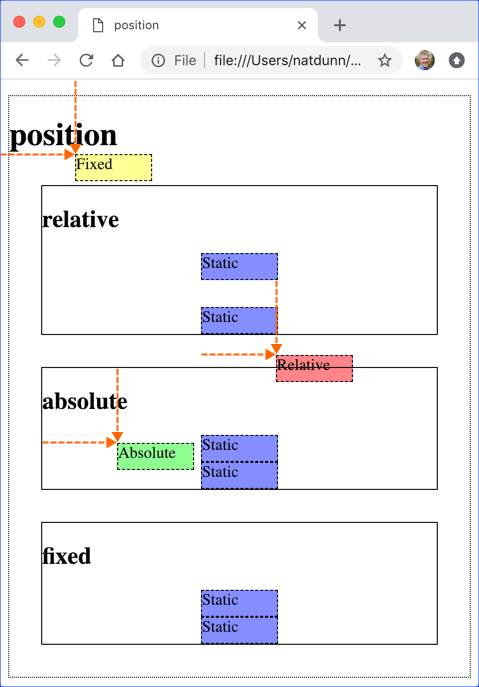 *A positioned element is an element with any position value other than static. auto - the element is positioned where it would be if it were positioned statically. A length value in units (e.g., 1em) that specifies the offset distance for that respective edge. A percentage value of the container element's width or height (depending on whether the property is a vertical or horizontal edge). For absolutely positioned elements, the edges are defined by the edges of the padding of the closest positioned parent. For relatively positioned elements, the edges are defined by the edges of the content of the element itself. For fixed positioned elements, the containing element is always the viewport and the edges are defined by the edges of the viewport. When using these properties to position elements, you can set either top or bottom, but not both, and you can set either left or right, but not both. Valid combinations are top and left, top and right, bottom and left, and bottom and right. The screenshot below shows how this code will render. The dashed arrows show the top and left offsets. Note that the fixed div will always stay in the top-right corner even if the page scrolls. Also note that the absolute and fixed divs get removed from the normal flow, such that the subsequent divs don't make space for it. The relative div remains in the normal flow, so subsequent divs act as if it were where it would have been if it were static. auto - the default. Elements that are later siblings sit on top of their earlier siblings if they are positioned to overlap. A positive or negative integer. The higher the integer, the higher an element is in the stacking order of its siblings. 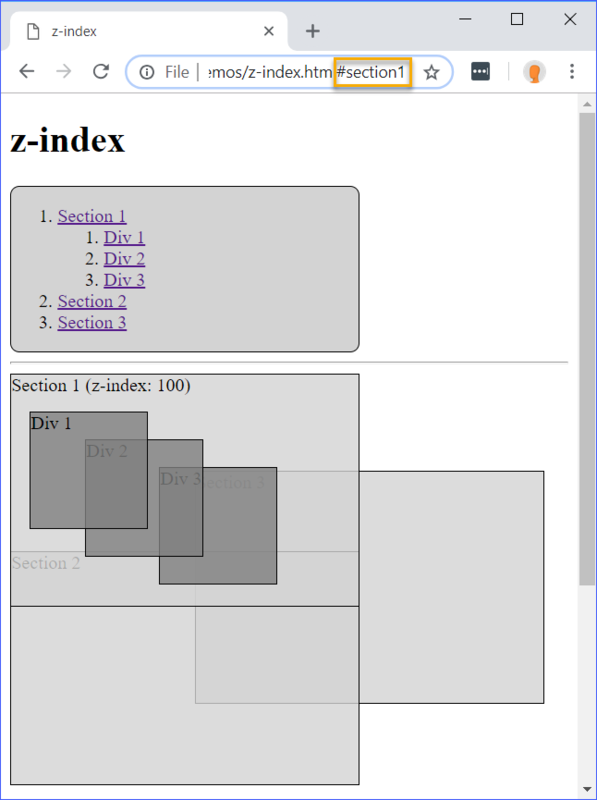 Open Positioning/Demos/z-index.html in the browser and click on some of the links at the top. You'll notice that the targeted element always rises to the top. That's because targeted elements get a z-index of 100. Floated elements are taken out of normal flow, but they continue to occupy space in the page layout, unlike absolutely positioned elements. All these examples can be seen in Positioning/Demos/float.html and Positioning/Demos/float-styles.css. Open Positioning/Demos/float.html in the browserand click on some of the links at the top to change the float values. These examples can be seen in Positioning/Demos/clear.html and Positioning/Demos/clear-styles.css. Open Positioning/Demos/clear.html in the browser and click on the links at the top to change the clear values. 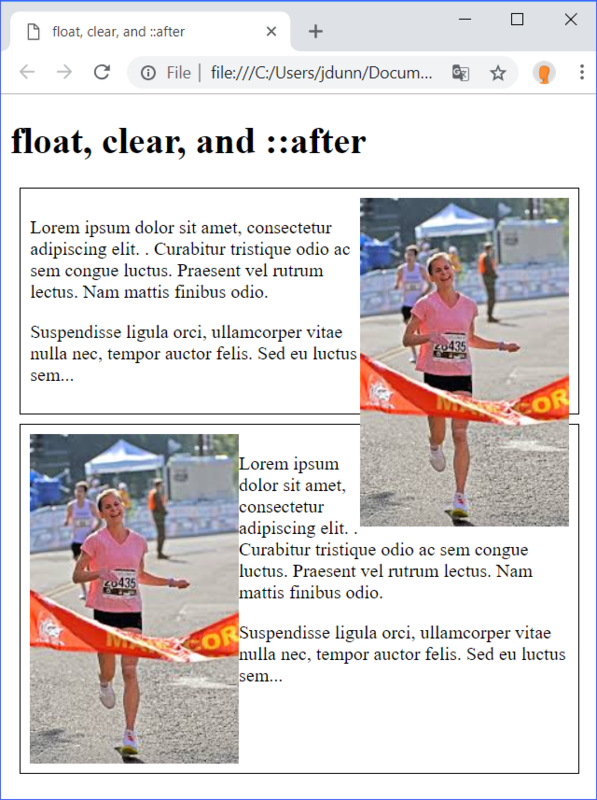 Before the development of more sophisticated CSS layout systems, float and clear were used to create entire website layouts, but this is no longer recommended. 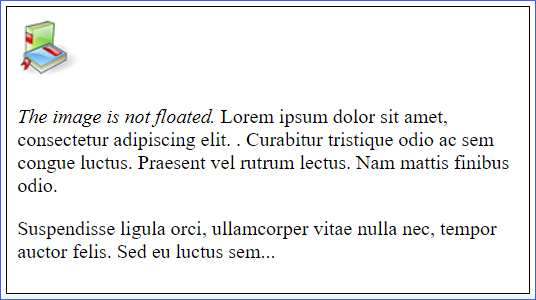 Sometimes the floated element is so big that when it is taken out of the flow, it extends beyond the height (which adjusts automatically for its content in normal flow) of its containing element. To fix this, it is possible to give the height a fixed value (e.g., 400px), but this is not great for fluid pages with containers that may shrink and grow depending on the width. 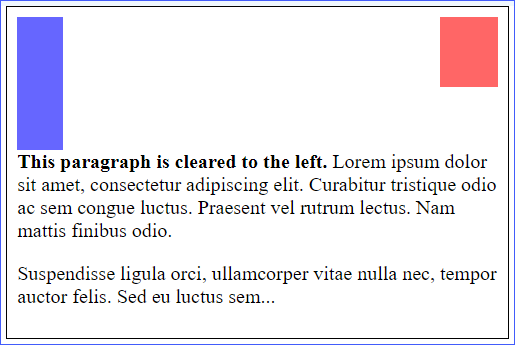 The solution is to use the ::after pseudo-element in combination with the clear property. sit amet, consectetur adipiscing elit. .
ullamcorper vitae nulla nec, tempor auctor felis. The first article element adjusts only for the text and not for the floated image. This allows the image to extend past its container and interfere with the rest of the layout. 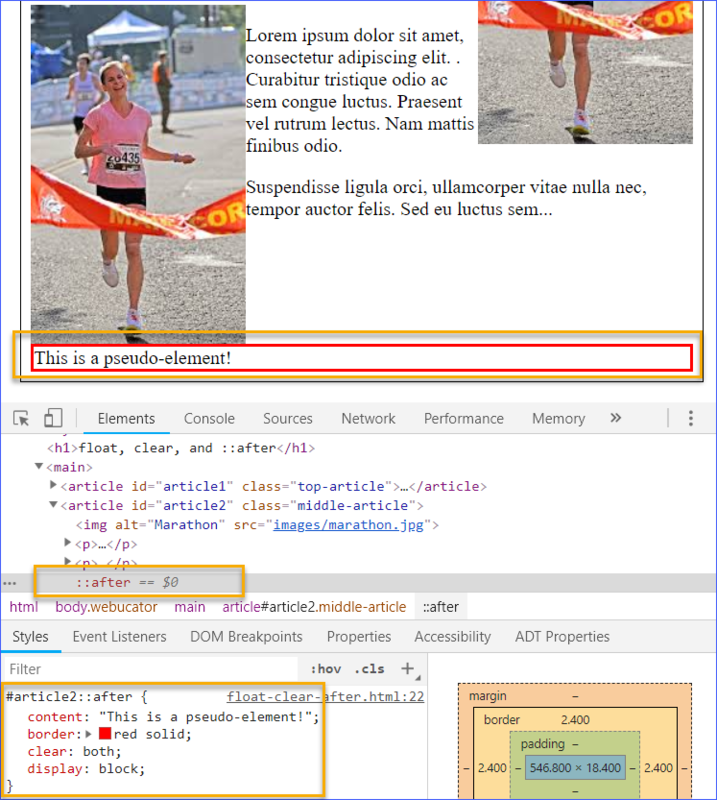 The second article element has a cleared pseudo-element added at the end of it, so the second article extends all the way to the bottom of the image. 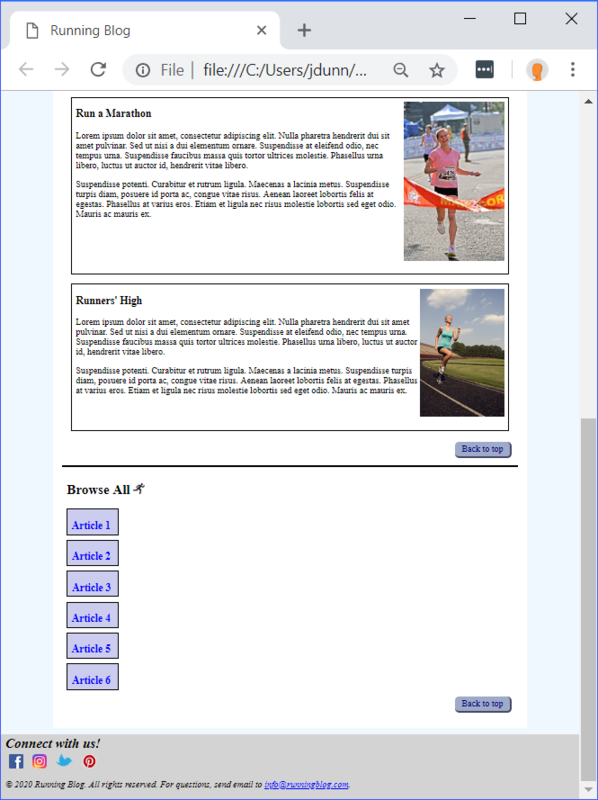 In this exercise, you will position elements in a page called Running Blog that is linked to from Runners Home (from the read-more links in the articles). 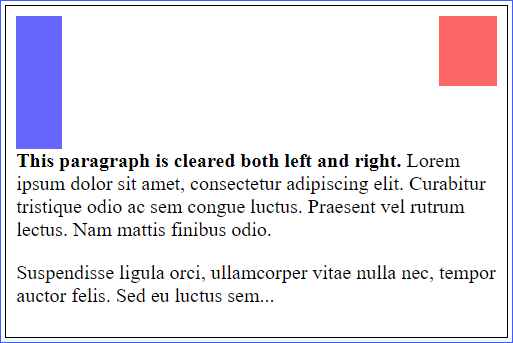 Open Positioning/Exercises/blog-styles.css. 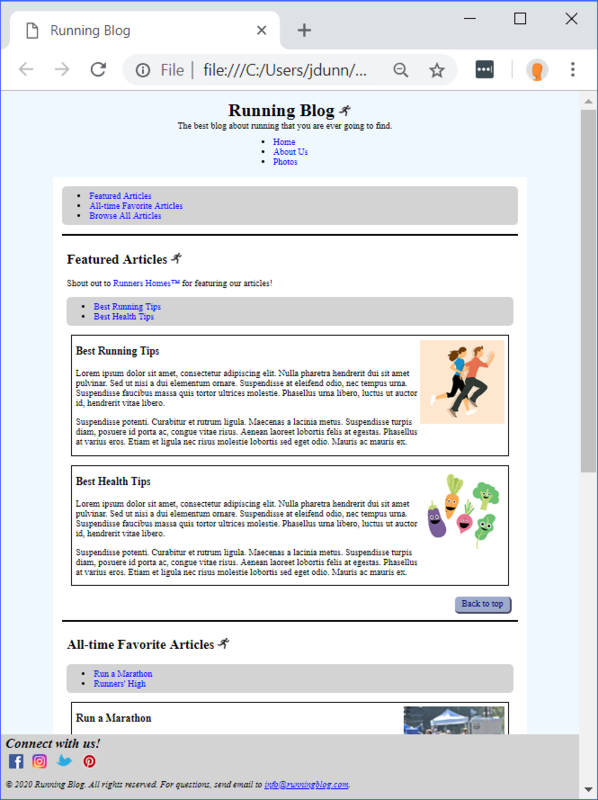 This is a stylesheet we created for Running Blog. Because this is a new stylesheet that you haven't seen before, take some time to go through the styles that already exist. This will help you when it comes time to add your own styles. Use your new knowledge of positioning to add some styles to this page. The object of this exercise is to practice using the properties covered in this lesson. Also, feel free to add or change any other properties that you know. Note that the footer is fixed, which is why it is in both screenshots.